Lymph nodes are present throughout your body. They are an important part of your immune system. 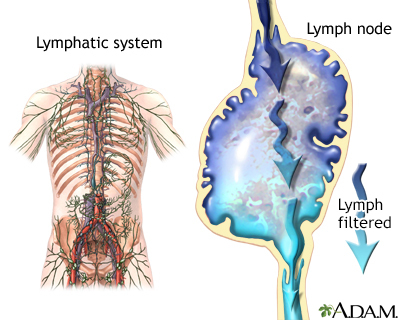 Lymph nodes help your body recognize and fight germs, infections, and other foreign substances. The term "swollen glands" refers to enlargement of one or more lymph nodes. The medical name for swollen lymph nodes is lymphadenopathy. In a child, a node is considered enlarged if it is more than 1 centimeter (0.4 inch) wide. Non-Hodgkin lymphoma. Many other cancers may also cause this problem. Which lymph nodes are swollen depends on the cause and the body parts involved. Swollen lymph nodes that appear suddenly and are painful are usually due to injury or infection. Slow, painless swelling may be due to cancer or a tumor. Painful lymph nodes are generally a sign that your body is fighting an infection. The soreness usually goes away in a couple of days, without treatment. The lymph node may not return to its normal size for several weeks. Your lymph nodes do not get smaller after several weeks or they continue to get larger. They are red and tender. They feel hard, irregular, or fixed in place. You have fever, night sweats, or unexplained weight loss. Any node in a child is larger than 1 centimeter (a little less than half inch) in diameter. Treatment depends on the cause of the swollen nodes. Armitage JO, Bierman PJ. Approach to the patient with lymphadenopathy and splenomegaly. In: Goldman L, Schafer AI, eds. Goldman-Cecil Medicine. 25th ed. Philadelphia, PA: Elsevier Saunders; 2016:chap 168. Tower RL, Camitta BM. Lymphadenopathy. In: Kliegman RM, Stanton BF, St. Geme JW, Schor NF, eds. Nelson Textbook of Pediatrics. 20th ed. Philadelphia, PA: Elsevier; 2016:chap 490.